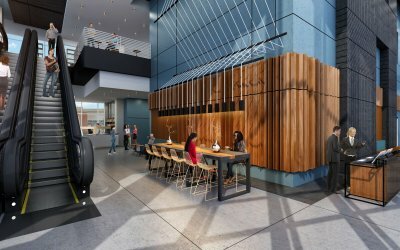 Midtown’s anticipated high-tech Coda located in Tech Square has recently announced food hall options and anticipated rooftop. “The Collective at Coda”, the latest dining option for Tech Square will present local chef-driven fares. Coda officials announced this week The Collective will feature Hector Santiago (of El Super Pan) to operate El Burro Pollo Burrito Kitchen; meanwhile, Ken Yu and Seven Chan will run Poke Burri (its sister location opened in 2016 in East Atlanta Village under the same name); and Buckhead fast-casual spot Wildleaf, from cofounders chef Randy Lewis and David Morse, will open a second location at Coda, as the Atlanta Journal-Constitution reports. 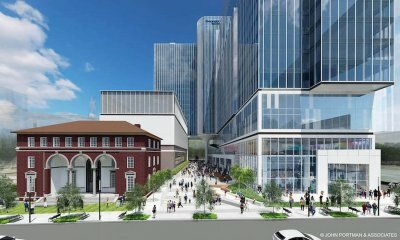 The full Coda project is expected to open in the spring of 2019.